In our previous post, you were introduced to a young man who sought to take over his father’s paint business. Little did Jason know, the work would not be easy and success wouldn’t happen overnight. Jason agreed to answer a few questions about how he learned to be a great painter and what it means to carry on his family’s paint business. Gardner Laboratories: When did it ‘click’ for you that being a professional painter required more than simply showing up for the job? Jason S.: It came from a desire to show my father, who founded the business, that I could do the work. He challenged me to actually apply myself and try to be good at something. I took for granted that he’d just give me the business eventually. He always said he had three children…my sister, me, and the business. He wasn’t going to give me anything I didn’t earn. A great painter should always be eager to learn new things. Image courtesy of McClain’s Painting. GL: Has that always been your motivation? JS: Actually, no. I very quickly fell in love with the process. One of my colleagues, an experienced painter named Erwin, was a beautiful painter. Every job he did always seemed perfect. I asked him how he did it and he told me, ‘There are tons of tools. Learn to use the tools and the painting is easy.’ So I learned about thickness gages and different brushes. That led to me learning more about how paint is manufactured and how to get different results from different paints. It’s really fascinating if you take time to learn. There are so many different tools and different paints and coatings…you can do amazing things if you simply know what’s available to you. GL: Can anyone become a great painter? JS: Maybe. [Laughs.] I don’t think I’m an authority, but I know what worked for me. I think it’s like any other profession, particularly those where you build things or make things. You can learn to be a great painter, sure. But it requires a desire to actually be great. I work with painters that have been in the business fifteen or twenty years. Their work is acceptable, neither great not bad. But it’s just work to them and when the job is done, they move on. People can tell, and clients can tell, when you really make the effort to make the final result great. That’s the difference, but to get there takes real effort. GL: Do you still paint often? JS: All the time. I’ve been with the company eight years and while my father has started to ease up on being in charge, I find that I’d much rather be doing the work. I like being with clients and advising them on glosses and making sure they are going to be happy. I still get a thrill when I open up a can and get ready to work. I have input on the day-to-day, but my Dad handles the big picture stuff, my sister does the operational things like paying bills and sending out invoices, and I manage all of the painting we do. No job is ‘finished’ until I sign off on it. Professional paint work includes a lot of different tasks. GL: What’s the most interesting thing you’ve seen or encountered as a professional painter? JS: I am surprised every day by how different the results are between a professional’s work and the work of a weekend painter. I don’t mean that as a slight. You can paint your own room or a piece of furniture and it will look great…to you. 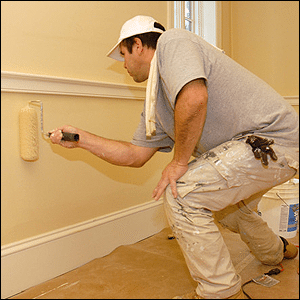 But a professional painter, a skilled craftsman, can help you in everything from choosing the right color and gloss to painting the surface in a way where there are zero brush stokes…there really is a difference when the brush is in the hands of a skilled painter. GL: What suggestions do you have for someone interested in becoming a professional painter? JS: The most important thing is to keep learning. Most of that learning comes from actually doing the work, but that counts! You have to be passionate about the work or else you’ll end up as just another person with a paint brush. It’s also important to remember that everyone starts somewhere and even the most experienced painter still has a lot to learn. If you don’t know the first thing about painting but want to work in the business, find a job IN the business! Work the paint counter at a superstore or find work on a paint crew…anything to be around other painters. You’ll be shocked how quickly you learn things and how quickly doors will open for you if you put your head down, soak in knowledge, and work hard. GL: What about for an experienced painter eager to start a business of their own? JS: As tough as it is to hear, being a great painter and having good relationships with clients doesn’t mean you can run a paint business. They’re two completely different things. I learned that I love to paint a lot more than I like to deal with vendors and banks and advertising. So I’m glad someone else handles that. But if you do want to take the leap and run your own business, then I suggest two things: First, make sure you paint better than anyone else. If something goes wrong, no one will ever be able to say anything bad about the quality of your work. Second, make sure that you keep clients happy. Happy clients pay their bills and talk to their friends. Follow those two suggestions and you’ve got a really good shot at running a paint business. Being detail-oriented is a strength. GL: We talk a lot about paint automation here. Where will the paint profession be in five years? Ten years? Will there always be a place for dedicated professionals? What about everyone else? JS: Absolutely. I’m 100% confident that the future will be great for professional painters. The people we were talking about earlier, those that just see it as a job – maybe there will be fewer of them over time as what we think of as ‘basic’ paint work is handled more and more by machines. But I’m confident that skilled painters, those that really understand the materials and the job and what the client wants…there will always be a place for professionals in that regard. GL: Thank you for your time. Good luck to you in the future. JS: Thank you for having me. Keep up the great blog posts! Thanks again to Jason for sharing his story with us. And while his story may be unique, the key takeaways are universal. At the end of the day, the paint work is what matters and to truly become an excellent paint professional, you must always be learning more and gaining more useful experience. Find mentors, challenge yourself with new tools and technology, and never stop learning the craft itself. To learn more about developing your talents as as professional painter and the tools available to you, click here!